Randomly survey 30 classmates. Record the values of the change in Table. Repeat steps one through five of the section Collect the Data. with one exception. Instead of recording the change of 30 classmates, record the average change of 30 pairs. Record the values of the average of their change in Table. Draw a smooth curve through tops of the bars of the histogram. Use one to two complete sentences to describe the general shape of the curve. Repeat steps one through five (of the section titled Collect the Data) with one exception. Instead of recording the change of 30 classmates, record the average change of 30 groups of five. 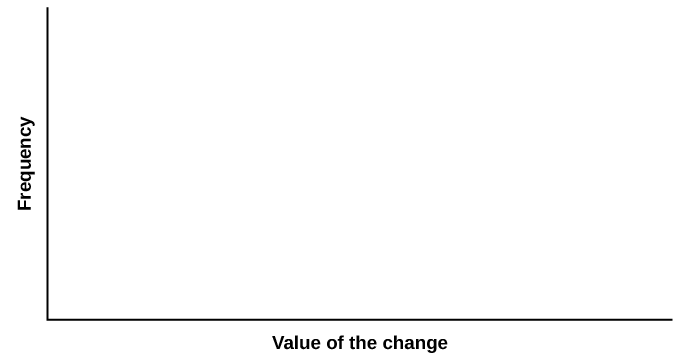 Record the values of the average of their change.